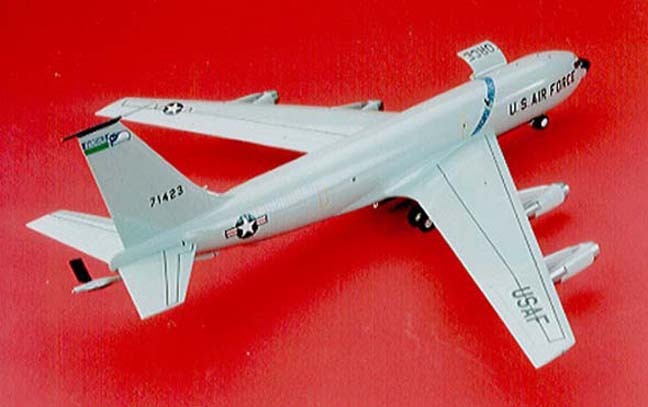 Some time ago we received the first militarised versions of Heller’s 1:72 scale Boeing 707 airliner kit An E-3B AWACS came first from Heller to be followed by an AWACS E-3D Sentry from Airfix. 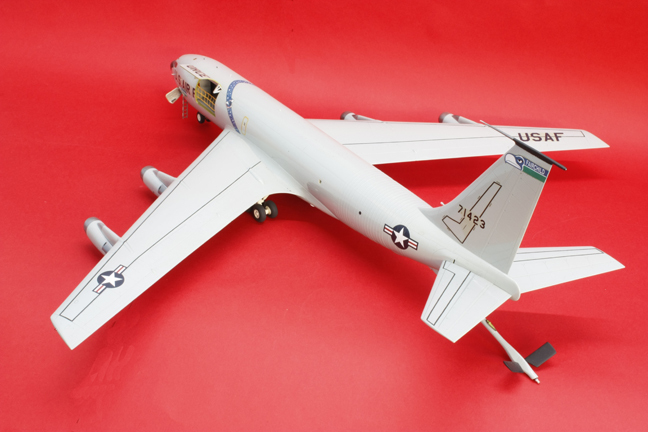 Now we have been treated to the KC-135 tanker version from AMT/ERTL to complete the ‘big three’ in anybody’s language! The kit comes in a very large box containing some big mouldings, which, due to their size, are liable to warpage. However, any warpage can, with care, be rectified. The small parts are all contained in bags on nice tidy frames typical of ErtI. The detailing on the surfaces is all engraved with fine panel lines and nicely produced ribbing. The cockpit area is full of detail which, according to my good friend who has spent 1,250 hours flying in them, is very authentic! They include the flight deck, navigator’s suite, electrical rack and bathroom suite with urinals, toilet and even a roil of toilet paper on the wall! There is also a PE set for the interior available. Two sets of markings are provided on the decal sheet one of which is a low-viz finish with dark grey on the upper surfaces. My sheet had no white printed on it so inspect yours before you start! The instruction sheet contains a mistake about the low-viz finish quoting FS 36118 when it should be FS 36081 Dark Gunship Grey. The sheet is very reminiscent of early AMT instruction sheets with all the parts named and colours for them provided, but in some areas it lacks detailed information. The fuselage could be warped so care may be needed to cement it straight again, especially as the location pins are tiny and liable to melt if strained at all. Do not cement the cargo floor in position as there is no positive location in the fuselage. The only really positive fixture is part 21, the front wall of the wheel bay, when it fits into the lip of part 102, the wing centre section, later on in the construction. You have been warned! Optional instrument panels are provided and, although not mentioned, an optional window, part 200, is included, though no decal is supplied for this undetailed piece. I would recommend that you put the small fuselage windows into each half before fixing together as the clear parts tend to fall through the provided holes which are slightly too big. The equipment rack behind the pilot’s seat, part 143, will need filling with plastic card since it could not be completely moulded. Part 116, the boomer’s cover, is designed to open inwards, but it’s a tight fit so take care when assembling. The boom itself is no problem. Weight is needed in the nose so I left the instrument panel off until the fuselage had set, then added a mix of shot gun pellets and epoxy resin, which was poured into the nose section. Hold the fuselage upright (nose down) until the mix sets and then add the instrument panel as normal. Both of my wing sections were warped, but careful cementing of the lower outer wing panels to the upper wing half will straighten them out. Ertl have gone to great pains to get the lower wing joints under the pylon mounts in order to avoid sanding etc. However, on the two models I have built there has been at least a 40 thou gap at each join. This I filled with a strip of 40 thou plastic card. Also, at the join of the lower outer and centre wing section, there is a tendency for the two parts to move up or down creating a step as there is no support below. To overcome this I used two 1/2 x 1/2in. squares of 80 thou plastic card cemented on top of each other and tucked them under the middle of the outer panel. When the centre section is now added it has something to rest on, (see Sketch 1). 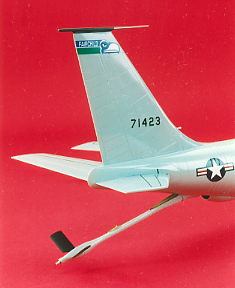 Remember that the wing has a dihedral and note that the engine pylons are at 90 degrees to the wing surface. Take care to align the pylons with the moulded sections atop the wings, I found that mine lined up best when on the opposite wing to that denoted. Just a little filler is needed around the pylon/wing join. For this I used a small drop of PVA glue smoothed in with a wet finger. The landing light covers, parts 208 and 209, can easily disappear into their location holes never to be seen again! To avoid this happening hold the parts with a small strip of Sellotape while cementing. Two fin tips are provided, with and without a refuelling light Both aircraft depicted on the decal sheet use the one with, but converters to earlier machines have the option of the one without I found though, that the fin needed a little sanding to get a snug fit with this part. The windshield, part 200, would not quite fit the fuselage without a little adjustment to the fuselage walls. After this the external roof, part 111, should now also fit quite well. I chose to leave the cargo door open but the hinges don’t have much to glue onto in the fuselage. Therefore, I added two tiny triangles of 60 thou card inside to provide some purchase for the struts. Parts 30 and 31, the receiver director lights, have a letter at each end, so take note of the instruction sheet or you could get them wrong. After assembly the main undercarriage legs have to be wriggled into position and it’s a lot more difficult than you imagine. If you do get them in without breakage you must cement them to the lower wing section. The cemented area is quite small and the weight of the model is apt to pull it apart. 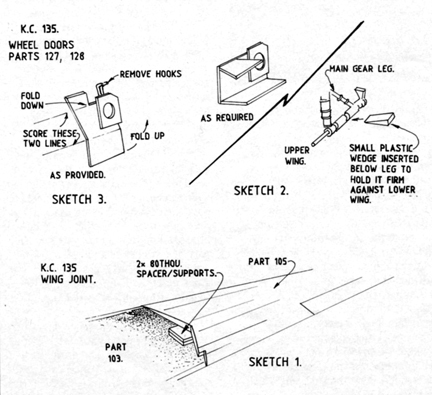 I pushed a small wedge of plastic between the leg and upper wing half to keep everything firm, (see Sketch 2). Gear doors, parts 127 and 128, are a bit strange as they are depicted half open and half shut To rectify them you need to score the thin lines on the doors and bend the top and bottom parts outwards as shown in Sketch 3. You will also have to remove the two hooks for mounting. 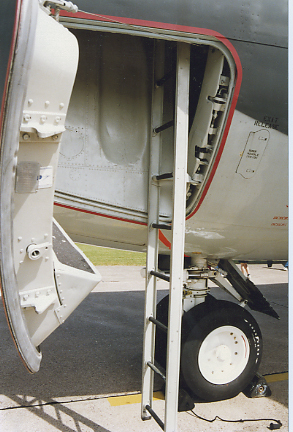 While in this area you could add the small strut for the crew entry door, visible in many photographs, as is the tiny cable used to close the door. 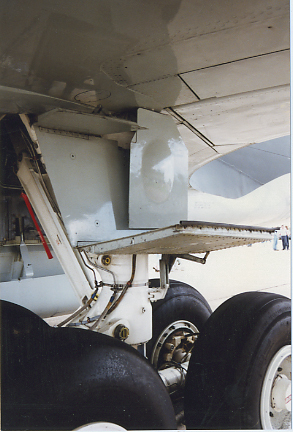 The main gear doors also need a couple of struts if you decide to leave them open. There is a pitot head and AOA indicator on either side of the fuselage, which I made from scrap sprue, rod and fuse wire. Some small aerials, also on the top and bottom of the fuselage, will be required. Check your reference as some aircraft use different positions. With the cargo door open there is usually a safety barrier across the doorway. It is soft and floppy and to simulate this I have used foil from a wine bottle cut into thin strips and super-glued together. Once fixed it can be arranged as needed. There are plenty of notes on colour in the instructions, but some of my notes may help. The interiors were painted as per the instructions but before mounting the engines. The silver areas were treated with Rub ‘n’ Buff then coated with Klear, but the grey areas were hand-painted after the overall spraying was finished to save complicated masking. Use Blu-Tack to hold the cargo and wheel bay doors in place and mask the windows with Sellotape. Spray the nose cone with Humbrol 85 semi-matt black plus the fin tip. Now mask this with tape and spray matt black around the anti-glare panel, wing and tailpiane walkway areas. When dry use narrow strips of tape to mask off the walk lines then spray the overall colour FS 16473, Humbrol 146 or Xtracolor 138 ADC grey. Both are gloss finish. Leave to harden then remove your masking and touch up any blemishes. Decalling can be completed and a coat of Klear applied over each item to hide the decal film and keep an even shine overall. I have left my model gloss but you can tone it down just a fraction with a light coat of semi-gloss acrylic varnish if you prefer, but don’t go too far. The extending boom is the part the receivers all see and take note of. It has bright Dayglo colours on it, to aid the pilots, as shown in our colour photo. Humbrol manufacture the three Dayglo colours 194, 208 and 209 which are close, if not totally matching. There are one or two parts in the kit, which are not used or mentioned in the instructions so it’s fairly obvious that AMT are going to produce further versions of this kit (get writing with your suggestions!). A few conversions spring to mind with items that are already available here in the UK, but you will need to research a little before you start. KC-135E while the big fat CFM 56 Turbofans will make a KC-135R These latter engines are also available from D.B. Productions as separate items moulded in resin. D.B. 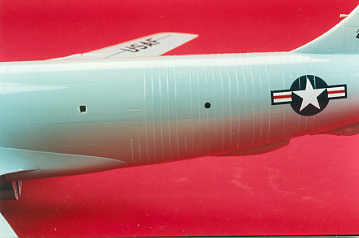 also plan a future release of parts for the EC-135N, that is the one with the giant radar in an enormous nose radome. These can be seen with the kit J57 engines or the TF 33s. There are a few ‘electronics’ variants that can be created using some home made aerials etc, such as EC-135A with J57s plus the capacity to refuel in the air; EC-135C with the TF33 engines and lots of aerials. Also you can have an EC 135K with J57s and the fuel dump tube that is spare in the kit, all these have the fin tip without the refuelling light Looking almost the same as the kit model is the EC-135P with additional aerials (antenna) and the KC-135A communications relay (combat lightning) aircraft with lots of small aerial blades above and below the fuselage. One or two transport aircraft are possible. MATS use C-135As with J57s and C-135Bs with TF-33s. Both versions deleted the refuelling boom, but retained the operator’s pod and substituted the fuel dump pipe which is actually included in the kit. So you see there are lots of possibilities for conversion from the basic kit. 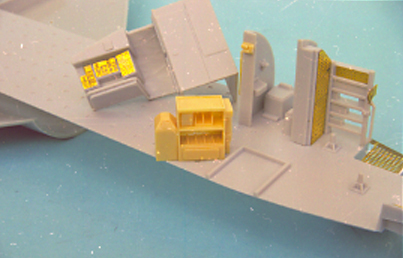 The latest hot news is that True Details from the USA are producing detail parts for the basic kit. Items such as the galley, windshield wipers and a set of replacement resin wheels, which have ready flattened and bulged tyres, will all be available —watch the modelling press for adverts! a bit hap-hazard. But, at the end of the day, you have a good value for money model. 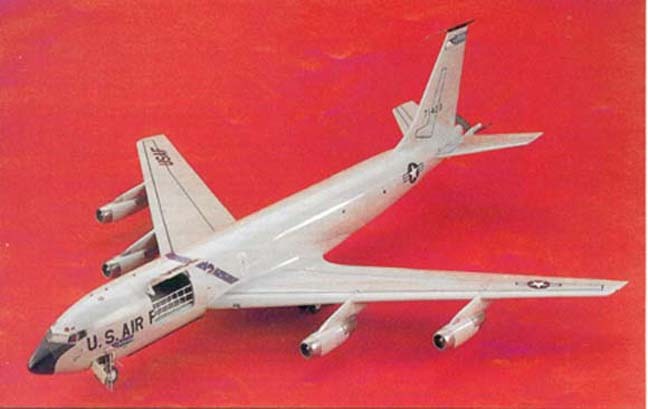 It is nice to see a manufacturer like Ertl, investing in kits of aircraft that have been high on many modellers’ “wants lists” for years! Ertl are to be congratulated and encouraged to fill this corner of the hobby now that nearly all other popular subjects have been done to death!